The Spring 2009 semester is now history! For a few weeks at least, there will be no syllabi telling me which chapters I must read; no writing assignments on pre-determined topics; and no quizzes, exams or other manner of testing. I will read, write and challenge myself however I see fit, thank you very much. That's not to say that I didn't enjoy my studies; in fact, my just-completed anthropology course, Rise of Civilizations, proved to be an exciting revelation about the central role of food in our social evolution. As a broad survey encompassing 12,000 years of human history and 10 different regions of the world, it wasn't possible to delve with great detail into the food practices of each culture but it was more than enough to whet my appetite to learn more. The ability to make and use tools, and to control fire first set early hominids apart from other great apes but it was how these innovations were used that hastened (relatively speaking) our journey down the evolutionary path. Stone tools dating as far back as 2.5 million years ago facilitated the consumption of meat, providing "useful cutting edges for a species that lacks both sharp teeth and claws for slicing meat, shredding, plants or digging" (Price, 63). The general scientific consensus is that meat provided the extra calories necessary to develop the larger, Homo sapien brain. "Once individuals were drawn to a specific attractive location that had a fire, they spent a lot of time around it together . . . We had to be able to look each other in the eye [and not] react with impulsivity. Once you are sitting around the fire, you need to suppress reactive emotions that would otherwise lead to social chaos. Around that fire, we became tamer." While Wrangham's theory is under debate, there is no doubt that with increased sociability and cooperation, humans began the slow transition from hunter-gatherers to settled agriculturalists and eventually, residents of towns and cities. 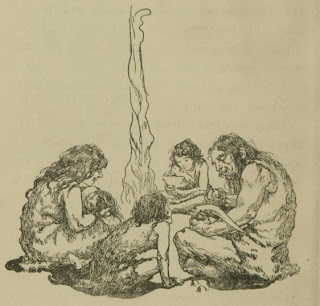 But just as eating raw meat can not be solely credited for human evolution, cooking by itself did not give rise to the ancient civilizations that were precursors of today's complex societies. Instead, it was our ancestors' domestication of plants and animals nearly 10,000 years ago that made it possible to produce sufficient, even surplus, food which in turn allowed them to redirect their energies toward developing the hallmarks of civilization, such as occupational specialization (e.g. farming, manufacturing) and economic trade. Within a short evolutionary timespan, every continent in the world, excepting Australia and Antarctica, saw the rise of such complex societies, marked by the emergence of large urban centers like Rome, the creation of monumental architecture such as pyramids, and the development of distinct artistic styles in paintings, personal ornamentation and pottery. It is through such artistic expression and detailed craftwork that we may trace the transformation of food consumption from basic necessity to political and ritual form. In one of the earliest pictorial representations of ancient ruling systems, the Royal Standard of Ur (2600-2400 BC) from southern Mesopotamia depicts a feast during which food, both harvested and on the hoof, are presented in tribute to the king. 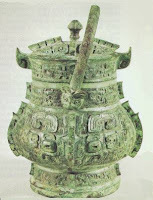 During China's Shang Dynasty (1700-1100 BC), skilled artisans created food containers of exquisitely molded bronze which were meant strictly for ritual purposes, usually as grave goods to be buried with its owner as an offering to honored ancestors. Of all the regions covered in the course, it was South America and its early cultures that captured my imagination. Whereas archaeological evidence points to long-distance trade between the civilizations in the Near East, Europe, Africa and Asia (all connected by land mass), allowing wide exchange of information and technologies, South American societies developed in relative isolation and yet managed achievements that rivalled those from across the oceans. Stretching from what is today Ecuador and down to the southern part of modern Chile, the Inca empire (AD 1476-1534) - the largest civilization in pre-industrialized Americas - enjoyed a very bright, albeit very brief, reign. Based primarily in the Andes Mountains but with the rich waters of the Pacific to the west and the lush jungles of the Amazon to the east, the Inca enjoyed a broad-based food supply ranging from fresh fish and shellfish, meats from domesticated llamas, alpacas and guinea pig, and crops such as maïze, potatoes, squash, beans and peppers. Food and other commodities were distributed across the region by way of an extensive paved highway system similar to the vast network of roads in the Roman empire and complete with waystations called tampus where travelers could rest and store their goods (Price, 422). 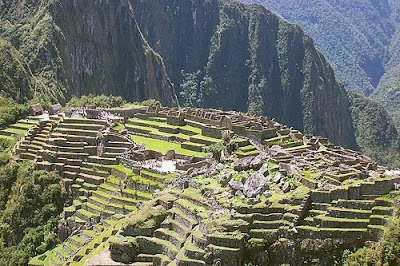 But this was not the only feat of engineering that the Inca shared with distant cultures with which they had no contact. Terraced farming in the Andes - cutting level areas within a slope for agricultural use - may have developed as far back as 2400 BC (Crawford, 414), which would predate even the famous 2,000-year-old Banaue Rice Terraces in the Philippines! Could this be the reason for my fascination with South American civilizations among all the ones covered during this course? A primal affinity, a subconscious recognition of a kindred culture? Or is it, as always, about the food? Great minds may think alike but when it comes down to it, the stomach rules the head! Peru, as the central land of the Inca empire, has 28 of the 32 designated climate zones, resulting in an incredible biodiversity of animals and plants, particularly its seafood and potatoes. But dishes such as papa a la Huancaína, lomo saltado, anticuchos and, of course, ceviche (recipes from Wikimedia Cookbooks) reflect not only Peru's diverse ecosystem but its rich social history as well. ". . . Peruvian cuisine is the quintessence of cultural fusion . . . blending between Inca and Spanish traditions [and] incorporating the flavours and techniques of the many immigrants that disembarked in the country's ports, in particular African, Chinese, and Japanese." Led by the country's most renowned and successful chef Gaston Acurio, who recently opened an outpost of his popular Lima restaurant La Mar Cebicheria Peruana in San Francisco, Peruvian cuisine is quickly gaining a foothold among American gastronomes and has already been hailed by Epicurious.com and Bon Appétit as one of the hottest food trends of 2009. Not one to miss the bandwagon, especially if it's carrying such fabulous fare, and inspired by my favorite ancient civilization, I decided to celebrate my (hopefully) successful completion of the semester by preparing Causa, a layered potato dish of seafood and avocado served chilled. Also known as Causa Limeña, it is a perfect representation of Peru's indigenous foods - potatoes (of which approximately 3000 varieties are grown), seafood and the chile pepper known as aji amarillo (yellow Peruvian hot pepper). The origins of this dish and the etymology of its name are as varied as the cuisine's many influences. The term 'causa' comes from the Quechua word 'kausay', meaning 'necessary sustenance', invoking the role of potato, its main ingredient, as the primary staple food in Peruvian history (Higgins, 207). But it is also the Spanish word for 'cause', which may refer to one story that the dish was created by patriotic housewives during the 19th century war with Chile. In fact, 'limeña' is the word for the women of Lima, Peru's capital. And yet, it is also another name of a variety of yellow potato, papa amarilla ('Lost Crops', 95). Got all that? No matter the meaning of its name, causa is a delicious example of Peruvian cuisine and a perfect summer dish. Crawford, R.M.M. Plants at the Margin. Cambridge U P: 2008. Dreifus, Claudia. "From Studying Chimps, a Theory on Cooking." New York Times. April 20, 2009. Evans, Mary. "What's Cooking?" The Economist. February 21, 2009: 79-80. Lost Crops of the Incas. Office of International Affairs. 1989. Price, T. Douglas and Gary Feinman. Images of the Past. McGraw-Hill: 2006. The dish presented here is an adaptation from two recipes for Crab Causa - the first is from The Peru Guide and the other from Whole Foods Market. Traditionally, it is garnished with olives and slices of hardboiled eggs; however, I opted for WFM's idea of topping it with a fresh mango-tomato salsa. I also prepared it as a 'loaf' but for an even more pleasing presentation, it may be prepared as individual servings using ring molds or ramekins. 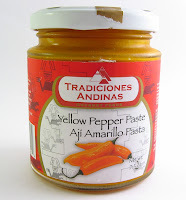 ** Aji amarillo paste is an essential staple of the Peruvian pantry and an important ingredient in many recipes. Although it may be difficult to find, it is well worth the effort to have it on hand. Otherwise, try this recipe for making your own paste! 9. Refrigerate for at least one hour before serving. 4. You may wish to allow guests to spoon it on their plates themselves as 'slicing' it is somewhat messy (chilling for several hours helps set it more firmly). Given time and patience, you may wish to plate individual portions using ramekins or ring molds. Serve immediately! Yay vacation! I recently started reading "Guns, Germs and Steel" which seems to have a similar theme to what you were studying. Interesting stuff. I would love to travel to Peru one day. Thanks for the little bit of history lesson here. Funny enough I've never had Peruvian cuisine. There's actually a Peruvian Restaurant near my house that I have yet to visit. I think I should. Maybe they'll have that dish on the menu. If not I'll just have to make it myself. Wow, that's a beautiful dish, Noodle. I'm impressed! And, as always, I really enjoyed the history lesson today. Lovely! nice history and such a beautiful dish - I sure want to taste it! I'm going to come back later and read your post in detail (in a hurry now! ), just wanted to tell you your food photo is beautiful! Good Grace! This is so sophisticated looking dish. It looks so professional, almost too pretty to eat! That's so pretty, and it sounds delicious! Great info here. I love learning about food history especially that of South America. I think I would love to take a World Civilization class someday. It seems pretty interesting. But at the same time, I don't really like being in school so I understand the need for a break. How do you come up with these things! That's so beautiful. It's almost like a trompe l'oeil. If we didn't know it wasn't a sweet dessert, we'd be shocked after the first bite. Shocked in a good way of course. Yum! What a beautiful dish you have made! I love it and wish I could taste it, and I love the history, your stores that you write so well! A really cause of celebrate you ended the anthropology course! I share with you the fascination with history and specially food history but ...this is a top-notch class about Peruvian people and their culture! The cangrejo dish (opps spanish ;) looks gorgeous! Learning about the origin of anything ,s great, so studying anthropology must be a real joy. As a foodie, I'd love to learn more about the history of human's eating habit and style. Thanks for these info. This picture is just calling me for a bite, a big one! congrats on finishing the semester! i definitely want a large piece of this!! Congratulations on the end of the semester and starting your summer vacation! This is a beautiful dish and gorgeous gorgeous photo! Thanks for all the neat information! Wow, thank you for a very informative post! I always learn new things every time I come here. The crab causa looks amazing with all the vibrant colors. It's got all the ingredients I like too. Thanks for the history! Your creation looks gorgeous! This is so tempting. Drooling.......! Me too! Just turned in my last assignment this past week. Though classes are over, dissertation is due at the end of the summer so not a total school vacation! Very nice job of the history. I enjoyed it very much. Congratulations on finishing your semester. Your crab causa is gorgeous. I'm not familiar with the aji amarillo paste. Can you find it at Whole Foods? If not, thanks for the recipe on how to make our own. Congrats on finishing the semester! I was wondering when you'd update, now that your post is here - I'll come back for the second part. Pretty interesting read, will just rest my eyes first. My DIL has been looking for an impressive dish to make for her turn at her Air Force Wives night Out. I think we just found it. I love your History lessons. What a beautiful dish! This is definitely getting bookmarked as a must-try. Thanks so much for sharing! What a work of art! Looks absolutely wonderful. This was a refresher for me. I studied anthropology for three years. And I just realized how much I miss it. I am grinning from ear to ear. Makes me wonder about the current path I'm on. Anywhoo, this dish you made is so beautiful! It must of pained you to cut into it. But I bet it was just as delicious as it looks! Congrats on being done! Woohoo - I bet Mr. Noodle broke out a bottle of the good stuff in celebration. The La Mar restaurant in your post is the one I am trying out next week (I've been slow here, but there are just too many options) with another foodie so it should be a good time, and yes its very popular! I can vouch for the delicious aji amarillo sauce. I see it around here and it is good, I like to use it with fish. They also make a red sauce, I'm out now so I cannot remember all the differences which is equally tasty. What a rainbow of colors. This looks so luscious that I'm wondering if you also could eat it spread on something crispy? Or is it better just to enjoy by the spoonful? What a unique creation. It looks beautiful. I would love to see Peru one day! Congrats on completing your semester! My husband just returned from a work trip to a few countries around South America (besides Brazil :)). He really enjoyed Peru and felt that it offered the most culturally rich experience of the places he visited. We hope to visit there together before we move back to the US. The food he had there sounded and looked amazing. This dish is gorgeous! Sounds like something I would really enjoy. enjoy your break Mrs. Noodle! Yay congrats on finishing the semester! Always such a relief when that last final is done, huh? That causa looks really cool - I've never made one and the ingredients are kinda unreachable here for me (I mean, I did have to fly home to get that mango chutney from TJs!). Congrats on the end of the spring semester! This looks absolutely delicious, I am completely jealous that you have a whole foods near you! It's the first place I go when I go home to visit mom and dad! I hope everyone had a great weekend! It's nice to know that I don't need to be on campus tomorrow . . .
Bob - Thanks! We have "Guns. . ." on our bookshelf but neither of us has had a chance to actually read it! 8-) This was my first time trying a layered dish and I was quite pleased. Jenn - I want to visit Peru so much! My husband came back from a business trip with such stories about how wonderful it is. My first taste of Peruvian food was in LA at a restaurant called 'El Pollo Inka" - have you heard of it? I know it's a chain but it was a really nice introduction. Diva - Thank you! The hubs and I will be celebrating with at least one of your Thursday concoctions! doggybloggy - Thanks! Wish I could send you a serving! Joie - Thank you! I hope you were able to enjoy the whole post later. Rebecca - I'm pleased you enjoyed it! Jennifer - Thanks! Happy to hear that I caught you at a good time. Lisa - Food history is so fascinating, especially its migration from culture to culture. I find South America so alluring - I hope to visit someday! In the meantime, food is a satisfying substitute. 3T Heppenstall - I have a hard time concentrating on studies when there are so many other things to do! 8-D Somehow I've managed for the sake of learning some wonderful lessons. girlichef - Thanks! When I'm enthused about a topic, I have a tendency to want to share it. And I'd love to send this for the chile pepper round-up. I'll check back on your post to confirm the deadline so I can send it on time and place a link here. Chef E - Thank you so much! I was so happy it turned out as well as it did. Gera - Thank you! My interest in food history and culture is one of the reasons why I ask you so often about the food in Uruguay! I hope to continue learning about the incredible diversity of cuisines in South America (hopefully firsthand - my husband and I want to visit as many countries as possible some day). Zerrin - Thank you so much! You do such a marvelous job of exploring the meanings behind the food habits of your culture so I know you can understand why I'm so enthusiastic about it. It's my pleasure to share what I'm learning! 5 Star - Thanks so much! My biggest concern was that it would break or become mushed when I flipped it over but all was well. Leela - I was wowed by the vivid yellow color imparted by the aji amarillo - it's even brighter in 'real' life! Phanitha - Thank you! I'm going to enjoy myself for the next week and a half but then it starts all over again! Pigpigscorner - Thanks so much! I enjoyed doing the research and making the dish. My Taste Heaven - Thanks! I was so happy with how it came out. Gastroanthropologist - Congratulations to you, too! And good luck with the dissertation - I'm nowhere near anything like that although my break is also short-lived. I'll start class again in 2 weeks. The aji amarillo paste is wonderful - I'm tempted to put it in everything. I hope you can get some. Not a morbid point at all - the ability to produce surplus food brought us to this point but it's our desire to continue producing that surplus without having learned how to equitably distribute what we already have that bodes ill.
Sam - Thank you! Our WF didn't carry it - I found it at a Latin grocery. If I can find the actual peppers as well, I'd like to try the homemade version. Selba - Thanks! It turned out to be a very delicious celebration. Yarntangler - That's great! If she does make it, please let me know how it turned out. Thank you! Wicked - Thank you! It's such a pretty presentation for a recipe that was really quite simple. I hope you'll try it out! Natashya - Thank you so much! I was pleased to have found such great recipes to work with. Reeni - It has taken me more years than it should have to figured out what I wanted to study! I'm just happy I found a program that let me focus on food. 8-) As for cutting into this dish, I felt a small twinge of regret but after the first taste, the poor thing didn't have a chance! Donna - Thank you so much! I was excited to see your latest post. It was funny and so fun to read. I'm going to be relaxing for about a week and then classes start all over again! Oysterculture - Mr. Noodle has been keeping me well-refreshed! 8-) I'm so envious about your upcoming visit to La Mar! I want all the delicious details . . . I had a tough enough time finding the aji amarillo but I'm also on the lookout for the red pastes - aji panca is supposed to be milder/fruitier (this is the one I'd really like) while rocoto is hotter. Where do you get yours? I may have to order them online eventually but in the meantime, I like searching through the Latin groceries. Carolyn - Thank you! I haven't seen any references to it being used as a spread but its consistency is soft enough for it. A bit like skordalia, perhaps? Donna-FFW: Thank you! Peru (heck, most of South America) is on top of our list of dream vacations, too. Lori - Thank you! I'm happy to be done although it starts back up again in a couple of weeks. I hope you and your husband do get the opportunity to visit Peru. I have extracted a solemn promise from Mr. Noodle that we will somehow, some day visit Peru and Brazil (and a few other SA countries). Hope you're enjoying your visit home! Nutritiontokitchen - It felt soooo good when I turned that exam over! It's funny that you mention unaccessible ingredients - I was drawn to this dish because everything was familiar and easily found (except for the aji paste - that took a little more effort). I know that the distance that food travels is an important issue but it's so nice to find unusual ingredients in order to try new cuisines. Dhi - Thank you so much! I look forward to seeing more of your gorgeous photos. And I am planning to make your MIL's fish patties soon. . . ! What an interesting dish! This I have to try! And again, great history lesson. I am fascinated with South American history and culture. And the food! Probably because some of the same forces also influenced the Caribbean islands. Good for you! This sounds delicious! What an excellent & apart looking dish! This is what I call: excellence! Yum! Congrats!! Do you have the summer off? My goodness, I've never heard of this dish before nor seen pics of it as well. However from the ingredients and description, I sure wish I was having a taste. Also thanks for the great piece of information. Peru also sounds like an exciting place to visit too! I always learn something when I come by here: Causa de cangrejo looks absolutely lovely. And now I know what it is, so thank you for that, TN! That looks so elegant and amazing with the beautiful layers! So my question is: When are you going to compile all of these amazing posts and write a book? The information you give on the background or history of food seriously needs to be published! TN - Will definitely give you an update. I felt compelled to try it after my raw fish post - I had ceviche on the brain. The aji panca is definitely milder and more fruity. I picked up my first batch of sauces while in DC, and have seen them around here. We have some wonderful mercados and Asian groceries that sometimes sell more food for other cultures than you anticipate seeing. the store I remember having it is a few short blocks from here, so I sense a leg stretching walk might be in order. I have not restocked as I took an inventory of my kitchen and realized it was out of control. But have made good progress so now might be a good time to reload. I'll get back to you on my findings. Congrats on finishing your semester! Your Rise of Civilizations course sounded great. Wrangham’s theory is really interesting, and it’s fascinating how “quickly” urban centers developed and gave rise to intellectual and artistic expression once large-scale food production could be sufficiently controlled. I appreciated hearing so much about Inca Civilization, too, as I’m planning to visit the west coast of South America late this year. I’ll be paying close attention to the food I come across there, and will hopefully be able to learn more about the role of food in the region’s development. And I loved seeing your recipe for cause de cangrejo, which gives me a great “in” to Peruvian cuisine! Enjoy your time off, and I hope you choose some fun ways to challenge yourself, even if it’s just to catch up on your sleep! Very nice...love all the info that you have in you post, it is amazing how much different is Peru from Brazil, where I grew up, anyway, thank you so much for sharing it. And thank you so much for visiting my site. This is one of my favorite foods in the whole wide world! oh my GOD! this looks FABULOUS! and thanks so much for the little lesson...I really enjoy learning about other cultures and civilizations! but still, I have to admire you for writing all this when you're just done with the school semester! I would be in a hot bubble bath lazing away! A gorgeous dish - really and fascinating. I especially loved the terrace farming in the Andes. History and food - entwined with our survival. Fascinating. Great post! Thanks for all of the info! Natasha - Thank you! I feel the same way as the Philippines' culture was so influenced by its history as a Spanish colony and American protectorate. Perhaps this is why this region is so intriguing to me! Fahrenheit 350 - Thanks! The dish turned out better than I'd hoped! Sophie - Thank you! I'm usually a bit lazy to pay attention to presentation but I'm really pleased with out this looked. Maya - Thank you but unfortunately I don't get the summer off: I'm registered for a 3 week intensive course starting next Tuesday and then another one in July. I'll stay busy! Jo - I had never tasted this dish before I made it but it sounded so good, I had to try it. When my husband came back from a trip to Peru, he had such wonderful stories about the country and food - I'd love to visit some day! OPC - Thank you! I'm so happy you enjoyed this post. I hope you've settled in comfortably in your new abode! I'll pop over to your site and see what you are up to. Oysterculture - Please do! All of our ethnic markets are at least a 30 minute drive away so I don't get to peruse their offerings as much as I'd like. Sapuche - Thank you! I was amazed at how efficient food production seems to have been the linchpin to social, political and economic development. The question for us now is: what is next for societies? Consider the Roman Empire: food was increasingly imported from outside territories just before that civilization began its decline. A harbinger for Western societies if we don't learn to manage our food production? I know that you'll enjoy your visit to South America! I hope you'll share some of your experiences with us on your blog, especially any observations comparing/contrasting the food cultures of SA and Asia (it would be fascinating to hear about how Peru's substantial Japanese population has impacted their cuisine). Juliana - Thank you! I enjoy your wonderful recipes and love to hear about Brazil. I would dearly love to visit there some day soon! Brenda - Thank you so much! I'm happy you found this post, then. I hope all is going well in SF for you and thank you very much for the Twitter message regarding this blog. Joie - So far, so good! I took my first morning walk with the dog and loved it. It was quiet so while the dog sniffed around the trail, I just daydreamed . . .
Mediterranean Kiwi - Thank you! Perhaps this is why the heart is such a powerful, compelling and instinctive symbol of harmony and cooperation. Perhaps all political affairs should be conducted in the kitchen . . . ! Now I look forward to seeing what Greek 'necessary substances' have inspired you! Claudia - Thank you! It's truly amazing how food is so important beyond physical needs. It touches on so many aspects of our lives - social, political, economic, religious - more than we might realize. As for terraced farming, I'm in awe each time I see photos of them around the world. But I wonder if they are better, worse or about the same as conventional farming in their ecological impact? Daily Spud - Oooooo! How I wish I could join you and Oyster at La Mar. Instead, I expect a full and very detailed account of your experience. I hope you've had a great visit to the West Coast so far and that you're enjoying San Francisco. Have a safe journey back home! Maria - Thank you! It's such fun to try new recipes like this one. Rico - Obrigada! I've been keeping up with your posts on Foodbuzz but it's about time I followed you properly so that I don't miss anything. Yum! That looks so delicious! Looks like a layered cake - my kinda cake! And you are a walking encyclopedia of detailed food knowledge. I admire the effort you went to! oh, you've really got to try kabocha...it's so diff from pumpkin! more solid, deeper, more intense, and a bit more savory! Very informative. The crab causa looks amazing. I've just bookmarked it, it's a winner. Forager - Thank you! When I first posted the picture, I though it looked like a cake, too! I was almost going to write something to warn readers that it wasn't what it appeared to be, just in case they were expecting dessert! I appreciate your comment - I love ancient history, especially when it's about food and about cultures in which I have such a deep fascination. I hope to visit places like Peru some day. burpandslurp - I saw kabocha at a local Asian market a few weeks ago so I'm going to check back to see if they still have any. I have to try it! so deliciously moist and Moorish. You have an awards or awards at my blog waiting to be collected by you. Ricardo - Thank you so much for sharing your awards! You are too generous! yes, absolutely, it's always about the food! Mighty impressive causa you have there. Unbelievable how you managed to get it to look so perfect on the plate. And forget 10,000 years of civilization, have you heard about the paleo or caveman diet? One of hubby Kris' friends is a fan. Love the way you write, TN! Your posts are always so informational and fun to read. And I hope you are enjoying your time off! Phyllis - Thank you! That was the most nerve-wracking part: flipping it onto a plate. I had the same trepidation with the flan-cake. One mistake and you've got a plateful of mess . . .
My FIL was totally into the paleo diet and I gave him a hard time about it constantly! It's got some merit but let's face it - considering that Paleolithic people didn't live very long is not a very good endorsement! Wow what a beautiful recipe and great history. Thanks for sharing. I'm looking forward to trying this dish. Vicki - Thanks for stopping by! Although this dish might seem a bit heavy with all the potato, avocado and creamy seafood, it really is quite refreshing. I think you'd enjoy it! Wow, I just tried this yesterday during a party. A Peruvian friend made it. I love it! Yours look so pretty and appetizing.